Spinning Classes Back in Gear for Fall!! Get out of that gym and find out what it means to really spin! Donna Panner will teach you how to spin your own yarn on a drop spindle---no experience necessary! In this three-module class, learn to spin for the first time or improve your technique and learn new skills including plying, carding, combing and silk reeling. Module 1, on Wednesdays from 6:30 to 8:00 p.m. starting Sept. 24, is “Spinning Basics,” a four-week course covering tying, woolen & worsted spinning, making CD spindles, luxury fibers and more. This class is a prerequisite for the second and third modules as well as for “Wheel Spinning” (which starts right after this course ends but is held on Tuesdays). Then two optional but exciting modules follow, to complete the 7-week course. In the first week of Module 1, called “Spindles and Wool,” the class will learn drafting, spinning woolen and worsted, and plying, while exploring a range of fibers and tools. 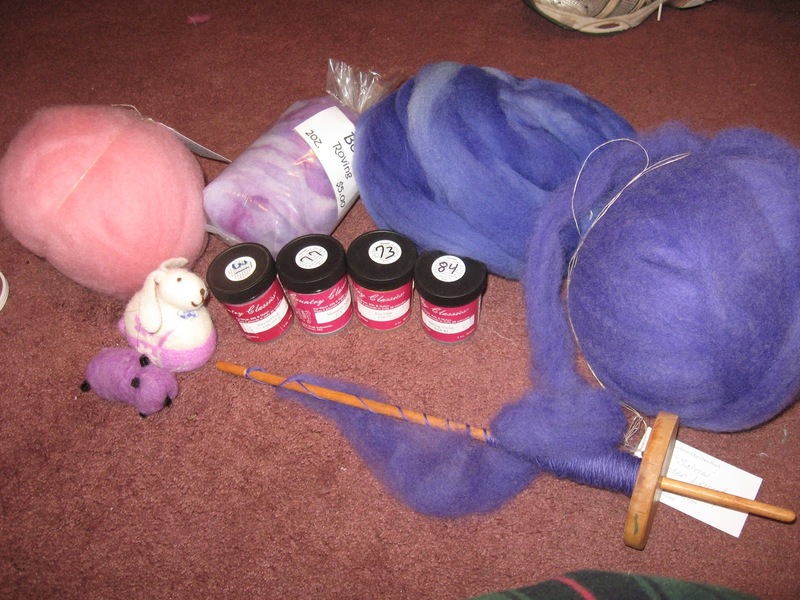 Fibers in the spotlight will be Corriedale, Falkland, and Bluefaced Leicester; students will need to bring spindles. Recommended text for this class is Spin It by Lee Raven (Interweave Press). The second class, “Tying Skeins,” will focus on how to use Niddy-Noddy as well as how to set the twist using steam from a tea kettle, and Donna will demonstrate spinning off the fold. This week’s fibers are mohair and alpaca; students are to bring Niddy-Noddies and WPI (wraps per inch) tools (optional). Week three, “Plying,” gives us Andean bracelets and how to make a quill/bobbin for your spindle. Fibers highlighted will be merino and merino blends. Then during the last week, “CD Spindles, Supported Spindles and Luxury Fibers,” we will make CD spindles and get demonstrations on various supported spindles including Navajo, Tahki and Russian spindles, and explore camel and other luxury fibers. This brings us right to Module 2, “Fiber Prep,” for two weeks: First Donna will lead an in-depth “Carding and Flicking Wool” workshop with “in the grease” wool, scoured fleece and plant fibers. Then the second week, “Blending Fiber” focuses on hackles, wool combs and drum carding. Next up, Module 3, “Silk,” in which students will learn to create yarn from various forms of silk, and Donna will demonstrate the preparation of silk hankies/caps for spinning. The initial 4-week course is $180; Module 2 is an additional $100, and Module 3, a single class, is $50. The complete package of all seven classes is $305 (reduced rate). Materials and fibers are not included and are to be bought at The Yarn Company. Not sure you are ready? Spinning Appetizer is Lesia Tristam may be all you need to make up your mind. every Sunday from 12-1, $28, advance registratino required. Interested in Wheel Spinning? Starts September 23! This 8- week course is held on Tuesdays, from 6:30-8:30 pm. Drafting experience required. Module one of this drop spindle class is all you need if you don’t have any yet, so sign up now! Read more here, including syllabi, and sign up now! Space is very limited, especially in the wheel class! A little over four years ago, I was on one of the Ravelry forums when someone posted a link to Fibre Fallout. I clicked on the link and thought it sounded interesting - an all-inclusive weekend of spinning and classes, and it wasn't expensive or far away, so I signed up. I only knew one other person there, but I made many friends and learned a lot. I took a Natural Dye class with Rita Schwab where we actually cooked plants to extract the dyes, then on Sunday I learned how to choose and skirt a fleece with Nelda Davis. 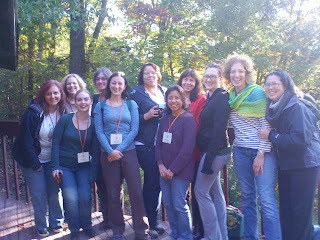 It was such a great weekend, I raved about it to all my Spin City-NY friends and in 2010 there were five of us who went. I took classes in Wheel Mechanics and Sock Yarn Spinning with Judith Mackenzie, and Spinning Fine Fibers with Patsy Zawistoski. They had expanded the weekend to include Friday afternoon classes as well. 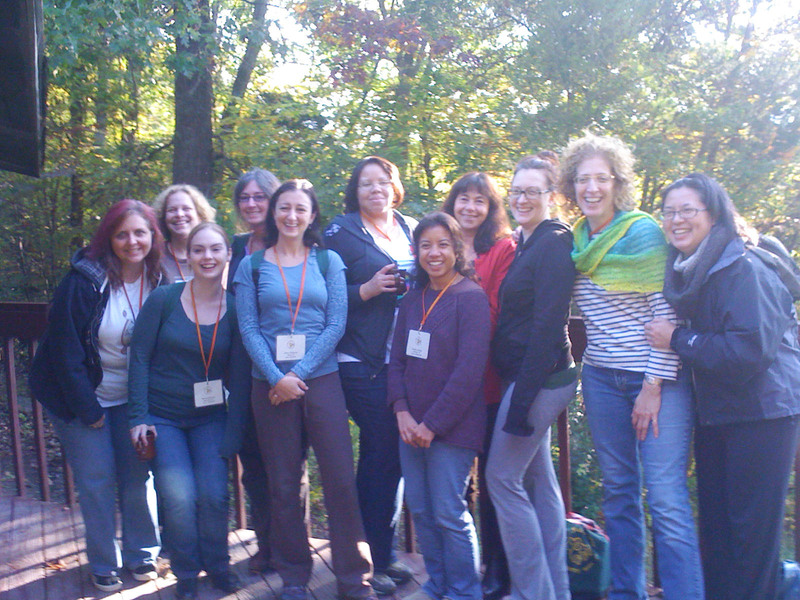 This past weekend, Spin City-NY was represented at Fibre Fallout by 14 people (a few of whom are not pictured here)! We had such an incredible time! Having spent all week staying up late making flyers, prepping for the Campaign for Wool event, and working late, I had slept about 12 hours in three days. But the excitement of the weekend had me up early finishing the laundry and shopping before heading off to New Jersey. The most difficult part of this event is choosing which classes to take when you send in your registration. They are all so good I wouldn't be disappointed with any of them! I started the weekend with Judith Mackenzie's Boucles, Bangles and Beads class, where we learned different techniques for making fun, textured yarns. My favorite was this one, which was made by pulling wisps of mohair locks between two silk threads. The grey yarn at the end of the bobbin is my coreless corespun alpaca/silk blend. I'm planning to make a lot more of this mohair yarn! The class was so much fun, it was quarter to six before I remembered to look at the time. 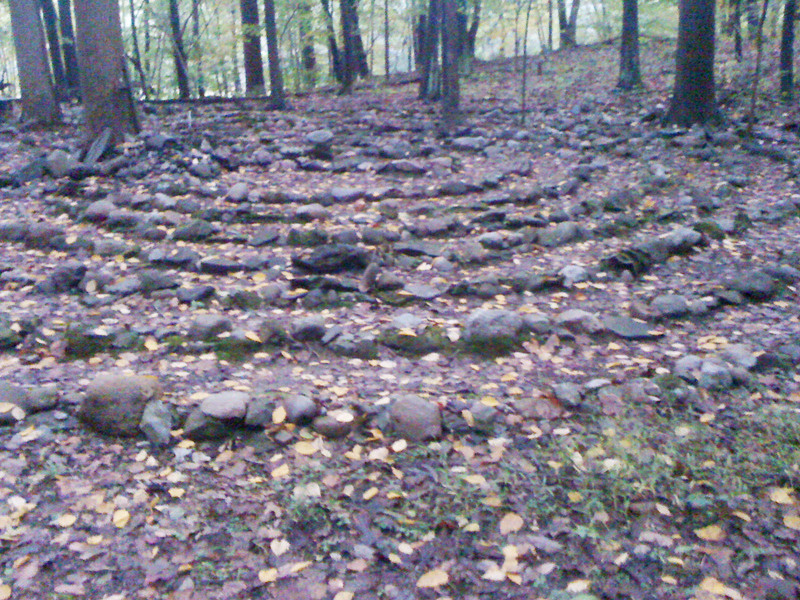 After class, Lynn, Lisa, Melissa and I went for a hike through the camp's trails to see the labyrinth, which we then walked through. Must put this on the to-do list for FF 2014, but with a drop spindle this time. Saturday's class was a full day dye class with Kathleen Taylor - we did spiral dyeing on superwash merino sock yarn in the morning, and dyeing on sock blanks in the afternoon. I loved the Country Classics dyes we used in this class! The colors are so true to what the swatches look like and very, very little color rinses out. And so vibrant! 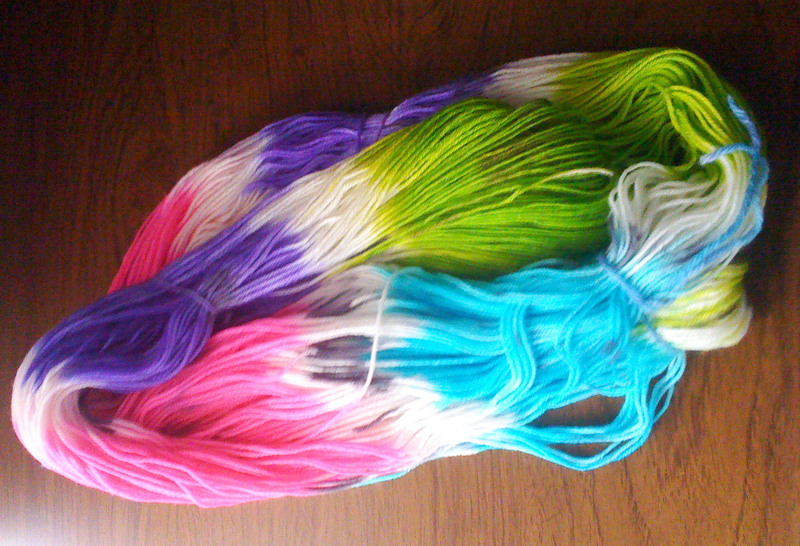 The colors I chose for the above yarn were the Wild Iris, Mountain Aqua, Key Lime and Very Hot Pink. Then I finished it with small dots of Raven randomly placed throughout the skein. 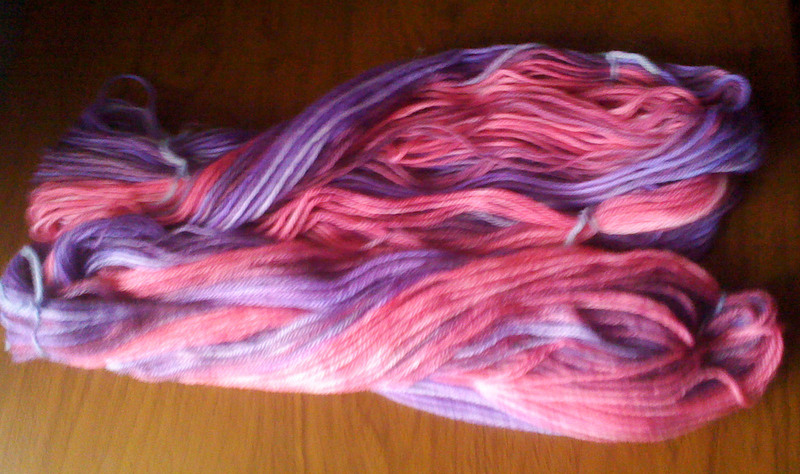 This was my first time dyeing dry yarn - usually I wet it first - so there was less color bleed than I am used to. I was disappointed at first that I had brought the wrong brushes. I know there is a pack of chiseled foam brushes somewhere in the house, because I kept seeing it for the past few weeks. Of course, when I went to pack for the weekend, they were nowhere to be found, so I ended up packing round stencil brushes. They actually ended up working out better than the chiseled ones because they made a more defined edge. So much better, that Kathleen said she was going to start using them herself. After lunch we dyed sock blanks. For those unfamiliar with them, a sock blank is two strands of sock yarn knitted together in a rectangle that looks like a small scarf. 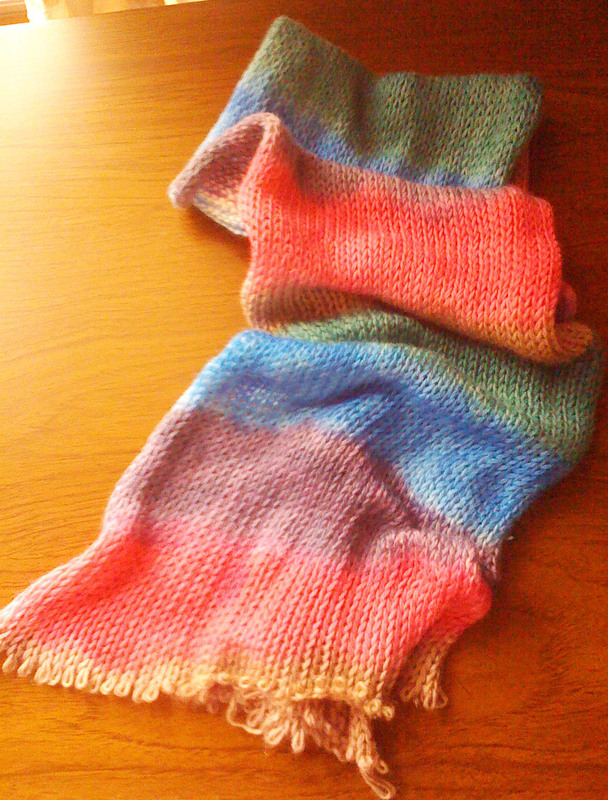 You paint your dye on the knitted fabric and when it dries, you unravel it and wind the yarn into two separate balls. When you knit your socks, they come out the same because the yarns were dyed together. For this one I used Bermuda Sand, Cherry, Lilac, Cornflower Blue and Evergreen. I was happier with this one, but I still think the repeats are a bit long. I'll be able to gauge better when I see how they knit up. Saturday night after dinner was the participants' fashion show, where I modeled my Strawberry Lace Scarf and a skein of singles yarn I finished from Loop's Purple Rain Clouds. 450 yards! Still trying to decide what to make out of it. If you haven't spun something from Loop clouds, well, what are you waiting for? OMG these are so AWESOME to spin! So easy to draft because the fibers have so much air in between - that is unless you squish them in a ziplock in your purse. Ask me how I know. 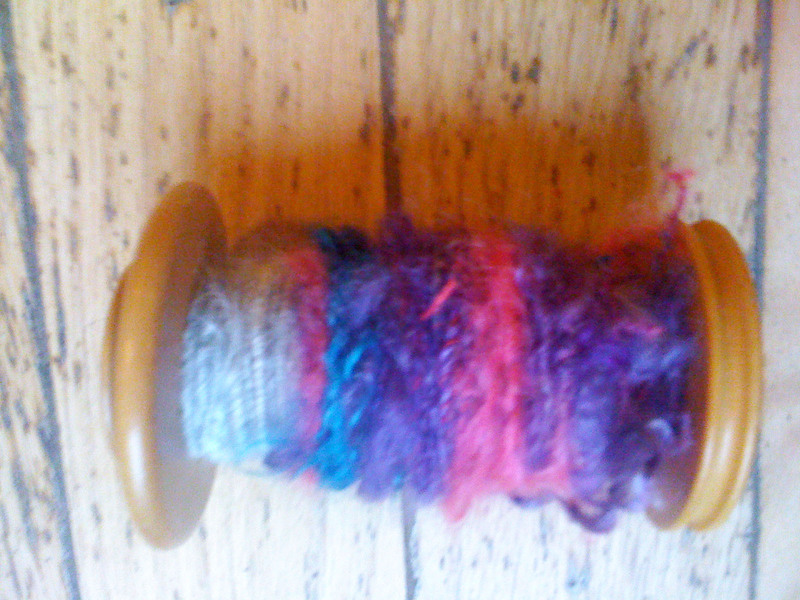 And the variety of colors and fibers in each one keeps it interesting. There were so many beautiful projects from everyone in the fashion show! In addition, each class had a table displaying their work, so attendees could see what the other classes were working on. 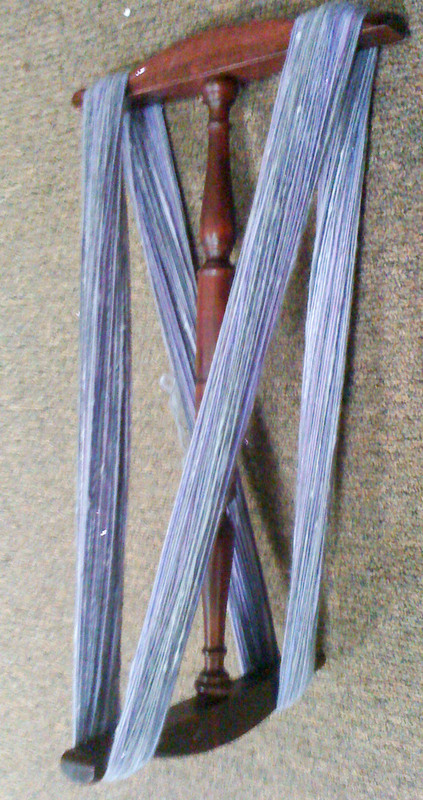 The weekend-long weaving class was my second choice, but dye is still my favorite. 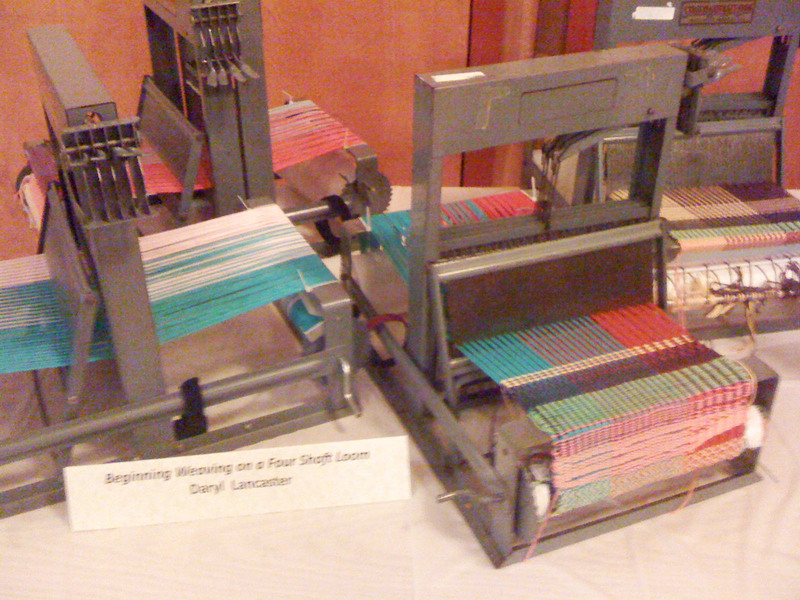 The weavers had these amazing projects on these tabletop harness looms. It looked interesting to learn all the different patterns. The weaving mentor, Daryl Lancaster, joined the Spin City crowd for dinner Friday and Saturday. She wore several of her handwoven jackets throughout the weekend and they were absolutely gorgeous! 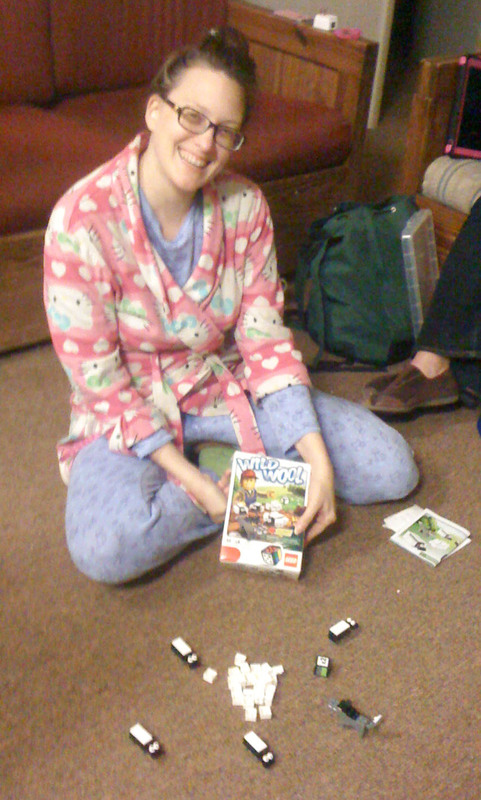 Saturday night ended up back at the lodge with a game of Wild Wool where you build sheep out of Legos. Basically, you roll the die and grow wool until Christina steals it. Sunday's class was my favorite, but it was definitely the messiest! Gradient Color Band Dyeing with Kathleen Taylor. 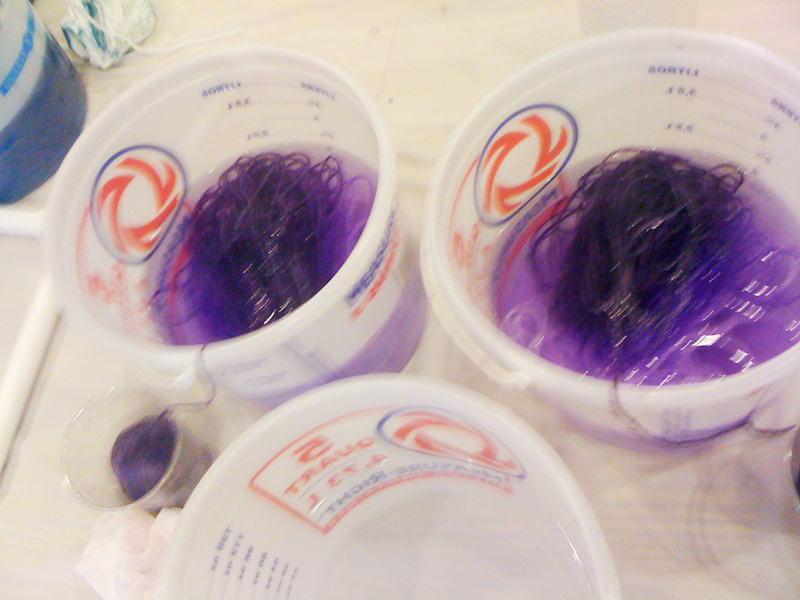 You wind your yarn into a tight ball and submerge the ball in your dye bucket (or buckets if you're doing two). 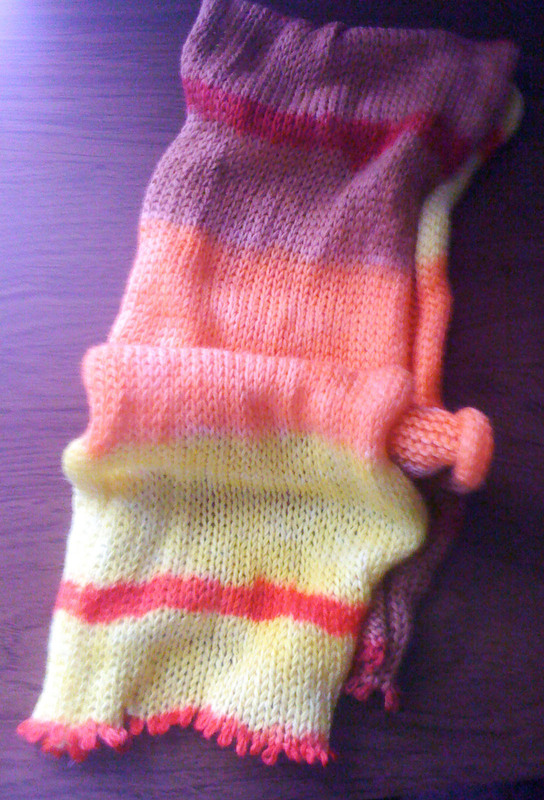 Then you pull a length of the yarn between your fingers to squeeze the dye into the yarn and lay it in the rinse bucket. You keep pulling lengths of yarn until the entire ball is unwound and in the rinse, and you change colors several times throughout the process. I started with Wild Iris. Shocking. Again, a learning experience. I should have done more of the first color before switching. But I like it anyway. It was so hard leaving and going back to work after such a fantastic weekend! The North Country Spinners do such an amazing job with this event and this year's was no exception. I'm already looking forward to Fibre Fallout 2014!